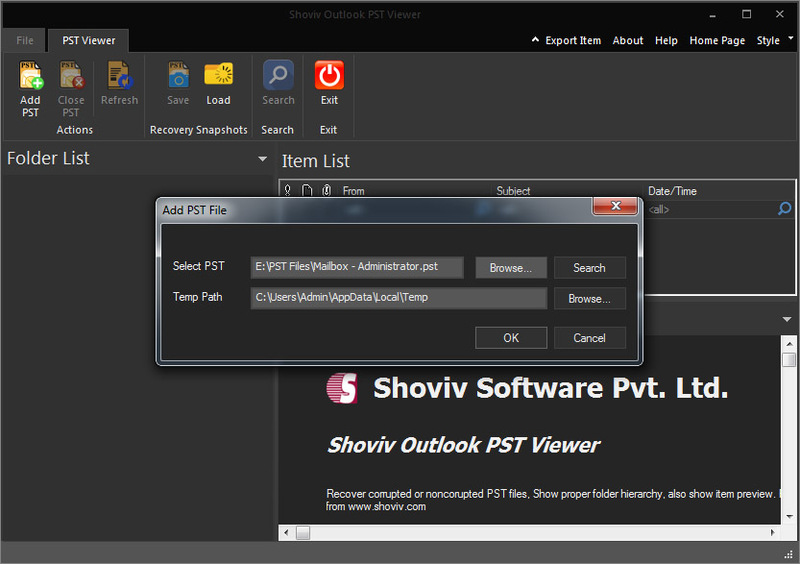 Outlook PST Viewer Software of Shoviv helps to view deleted items and corrupted Outlook PST files. View Outlook PST Files software has a very simple Graphical User Interface (GUI) by which the users can easily work with the software. There is no size limit for viewing the PST files the users can view the Outlook PST files in bulk as the users want. With the help of software the users can only view the deleted items and corrupted PST files but the users cannot save the recovered PST files, for that the users have to buy our full version of Outlook Recovery Software. The Outlook recovery software also helps to convert the Outlook PST files to different file format such as: EML, MSG, HTML, MSG, UNICODE , CAL, VCARD etc. as well as Software has a unique feature of migrating Outlook PST files to Office 365 and Live Exchange Server. If the users has more query about the tool than the users can contact our technical support team, our technical support team is 24*7 here to assist you. Programmable file converter. Copy, delete, change, edit, extract, reformat data records: ASCII&EBCDIC text or binary files. Fixed or variable record length or delimited (e.g. null&tab). Import&export CSV. Analyze XML and HTML, logs, clipboard.